A team of attorneys recently came together to help Hugo*, a boy from Guatemala who came to the U.S. to find safety with his sister in California. 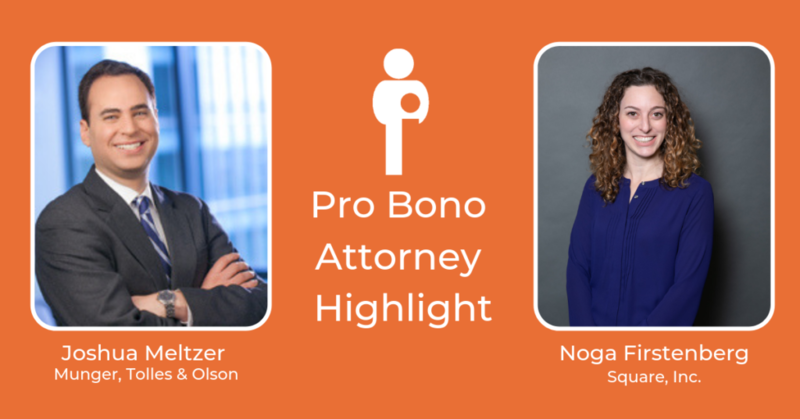 Attorneys from the law firm Munger, Tolles & Olson along with attorneys from Square, Inc joined forces for the first time to help Hugo with his immigration case pro bono. Thousands of children like Hugo are forced to appear in immigration court alone without an attorney by their side. Hugo is one of the lucky ones, especially because he had Joshua Meltzer and Noga Firstenberg by his side. Josh, who is also the Co-Chair of Munger Tolles’ Pro Bono Immigration Practice, has worked with our KIND San Francisco team and has helped place a number of other pro bono cases with the firm. Noga and Square recently got involved with KIND’s work, taking on four children’s cases pro bono. The entire teams’ work and dedication to address legal hurdles, tight timelines, and complex filings resulted in Hugo’s case moving closer to the protection he desperately needs. 1. Can you share a bit about Hugo’s case? What was it like meeting him for the first time? Josh: Hugo came to the United States from rural Guatemala. I’ve been impressed by Hugo’s resilience in adapting to life in the United States, especially given that his primary language is a Mayan one and he speaks no English and limited Spanish. His guardianship case was particularly challenging because we had only two months (including the December holidays) to prepare all of his guardianship materials and provide notice to his family members in rural Guatemala, who had no access to mail and very limited phone access. We needed to seek an expedited hearing date from the court, which fortunately was granted, and we were successful in having Hugo’s sister appointed as his guardian. Hugo is clearly a very bright kid, but there is no way that he would have been able to submit these guardianship materials without counsel, as the process is quite complicated even for experienced lawyers. It took a tremendous effort by the Munger Tolles and Square teams working together to meet the expedited schedule in this case, and it was a wonderful feeling to be in court and see the judge grant the guardianship. Noga: Hugo came to the US from Guatemala about a year ago to live with his older sister in California. He was abandoned by his father after he was born and had to leave school at age 14 to begin supporting himself and his mother. Meeting him and his sister was a very humbling experience, and also very empowering because we explained that we would be able to help him with his case and with his goal of remaining in the US. One of our biggest challenges has been communicating with Hugo. His original language is Mam and we were not able to find an interpreter who was able to speak his particular form of Mam. As such, we had spent the first hour of our first meeting introducing ourselves and explaining the immigration process to Hugo, but he had not understood most of what we said, but also hadn’t wanted to let us know that, perhaps feeling bad that he couldn’t understand. Hugo would not have been able to represent himself without KIND’s help, both because of the language barrier and the sheer complexity of the process. 2. What was your biggest lesson-learned or personal growth moment during the process of working with unaccompanied children? Josh: I have learned during the course of working with unaccompanied children that many have suffered significant trauma in their home countries or in the process of coming to the United States. It can be challenging to create the strongest case for relief for your client while also being sensitive to how painful it may be for the child to relive that trauma. KIND provides great support in striking that balance. Noga: I am awe-struck by the strength of Hugo and his family. His persistence, tenacity, and humility in the face of all the hoops he has to jump through to live in the U.S. are inspiring. His older sister, who is also raising her own children including an infant, accompanies him to all his meetings and hearings and helps to translate from Spanish into Mam for him when necessary. Working with Hugo is a constant reminder of the privilege I have as a U.S. citizen and the power I have to help others as an attorney. 3. What would you say to other attorneys considering taking a case from KIND? Josh: I would strongly encourage other attorneys to consider taking a case with KIND. There is nothing quite like the feeling of knowing that your hard work kept a family together. KIND has great people and provides fantastic support, so even if you have no experience with immigration work, I highly recommend taking on a case. Noga: The experience has been wonderful for me and my Square colleagues working on Hugo’s case. It is an incredible way to use our education, resources, and time to make meaningful change and directly impact a person’s life while also fostering a personal relationship with our client. Further, it’s been a great opportunity to collaborate with attorneys in my own office, with Josh and the Munger Tolles team, and KIND attorneys to learn from each other and problem-solve together. 4. Why do you think it is so important for attorneys to engage as advocates for pro bono clients such as working with vulnerable, unaccompanied children? Josh: Many of us became lawyers in order to help those in need. As lawyers, we have a unique opportunity, and I would argue obligation, to advocate for vulnerable members of our society. In the criminal justice system, people are guaranteed a lawyer, but there are no guaranteed lawyers in the immigration system even when the consequences of deportation can be even more dire. It is shameful that our country does not provide guaranteed counsel for unaccompanied minors, but until we can fix that, the private bar needs to fill the gap. I am proud that Munger Tolles and Square are part of that effort. Noga: I strongly believe that our position as attorneys comes with a responsibility to engage in pro bono work. To me, direct representation is the most powerful way to see what we can accomplish on behalf of others and is the most personally rewarding. I think it is incredibly rewarding to create a positive personal relationship with a child who may have only had negative experiences with the law and legal system in the US; to show them there are people who care about them and that differences in language, race, or religion need not be a barrier between people; and to model ways that they can give back to the community in the future in whatever profession they choose to pursue. *Child’s name changed to protect his identity.